Last week I had the immense pleasure of meeting the one and only Guido Palau. Guido, for those of you who aren't familiar, has been a hairstylist for years and years, and is absolutely inspirational. He works on fashion shows the likes of which you’ve heard before -- Marc Jacobs, Ralph Lauren and Calvin Klein might ring a bell! Add to that tons of ad campaigns and magazine shoots and he's got myriad experience under his belt. Guido represents Redken, using their products at shoots and shows, and last week he sat down with The Beauty of Life to discuss how he conceptualizes hair each season and the products he uses to make hair dreams a reality. Read on to discover more! What do you think are the trends for spring and summer? It’s not so obvious this season ... hair wasn't so defined. It wasn't about red carpet hair, it was the antithesis of red carpet hair! Hair was classics but with a twist, and it was a challenge for me to do that. 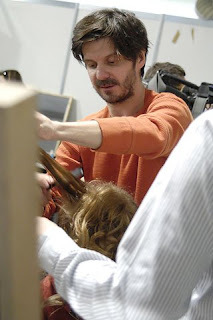 But I worked with products to redefine the texture and quality of hair, and a new way of presenting hair. At Prada, I did the classic chignon but overlacquered the hair. All the things you would normally not do! I layered spray until the shape became molded and space age-y. At Peter Som, I did a half-up, half-down look. I used Redken Fabricate to layer and make it look matte, and finished with a touch of baby powder. What do you think of hair products in general? Women are keen to know about how to change their hair quickly. Use hair products as a fashion accessory to revamp a normal look. Reinvent classic shapes and bring them into now -- make them look new to the eye. I've been doing shows since the early 90s. Calvin Klein for 15 years, Marc Jacobs. I help to create their woman. You know who they're aiming their shows at -- I'm there to encourage them and help create something for the runway within their parameters. It's the collaboration that I really enjoy and find stimulating. It could be putting hair under a hat or in a simple ponytail, or doing something very elaborate. It could be inspiring women, changing the way we look at beauty. It's amazing where beauty has gone in the last 15 years. We're seeing very exciting things, people's perceptions are coming out. The last time was the early 90s with grunge and Kate Moss. Beauty went on so many journeys, and women have so many choices about how they want to look. The whole idea of perception of what is beautiful is totally different. Maybe this is a time of change! I like seeing a woman that looks confident. It could be any style, but I just find individuality really inspiring. She's just HER. It's more inspiring than Hollywood. I like the person who's laughed at on the red carpet! What were your favorite shows this season? Prada -- the girls looked womanly. Louis Vuitton -- Everything was DONE. Nothing to hide that it was a fashion show. Bags, necklaces and big frizzy ponytails. Balenciaga -- Because it was BALENCIAGA! As an ensemble, when you work with someone with such a vision and it's so impactful, it’s very impressive. Ralph Lauren -- The American lifestyle, the beauty of the girl. Ralph doesn't want a trend, he just wants the girl to be beautiful. That even someone in the industry that long still has a passion for beauty ... to get carried away by the whole "smooth jazz" thing. It's really about the real woman. I'm lucky to work with such a fantastic bunch of designers, from one extreme to the other. I have a good balance of everything by the end of the season, which is good because I need to understand every sensibility of hair. What tips can you give women trying to do their own hair? Women have to try things, not just stare at products and get Cindy Crawford hair! You have to put in a bit of legwork. Try things out, do it the night before you wash your hair. You've got to work it out! You have to be gung-ho and want to do it. For example, when you're doing natural hair, when is it natural and when is it a mess? If you say it works, it will! Because you're gonna make people believe it!